Package Contents: 15 randomly inserted cards per booster pack, including 1 premium card in every pack. Players will get to draft like a master as they are taken back through time to experience some of the most popular planes, mechanics, and spells in Magic's history! 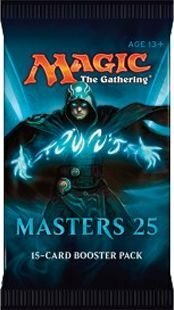 Nearly every card in Masters 25 features a watermark, representing its original expansion symbol! Look for randomly inserted rare and mythic cards in some boxes like Phyrexian Obliterator, Jace, the Mind Sculptor, Azusa, Lost but Seeking, and more!